I do not know too much about the Falcon, (I have never seen a film from the series – there was one – TheFalcon in Danger – on late night television this week, but being the ‘technical incompetant’ that I am, I botched the recording) but before I sign off of this series of posts about The Saint, I thought it was worth a brief introduction to the character. A snippet from the, Classic Film Guide. 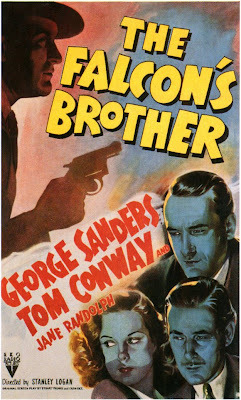 After playing Simon Templar aka The Saint five times in an earlier RKO studio series, George Sanders played the similarly suave detective Gay Laurence (Americanized to Lawrence) in the first Falcon films before giving way to his older brother Tom Conway in the aptly titled fourth feature The Falcon’s Brother (1942). Conway then played Tom Lawrence a total of nine more times through 1946 to complete the original series, which actually had three “poverty row” additions that featured John Calvert as Michael Waring in the late 1940’s. 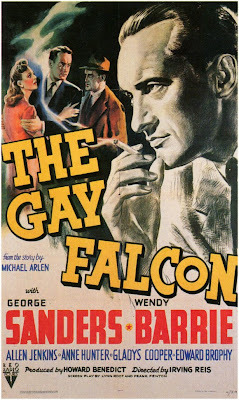 Based on a story by Michael Arlen, the original entry in this “new” series titled The Gay Falcon (1941) not only featured Sanders but also actress Wendy Barrie, who’d appeared opposite the actor in three of the Templar mysteries including (Sanders’s last) The Saint in Palm Springs (1941). 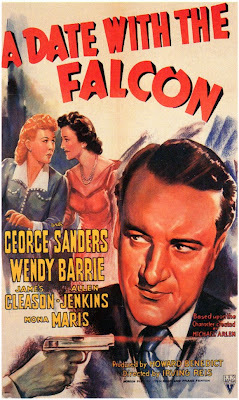 The Falcon character was so similar to RKO’s earlier B movie detective that The Saint’s creator Leslie Charteris sued the studio. Wikipedia (yes, I know it’s not reliable) elaborates that Leslie Charteris even had a shot at reprehensible scallywag, The Falcon in the book, The Saint Steps In. Sanders appeared in the first three Falcon films, which followed the Saint pattern so closely that author Charteris sued RKO for plagiarism. Charteris pokes fun at The Falcon in his 1943 novel, The Saint Steps In, with a character making a metafictional reference to the Falcon being “a bargain-basement imitation” of The Saint. Wikipedia further goes on to suggest that The Falcon was created because the rights to The Saint character were too expensive. The Gay Falcon is the first in a series of films about a suave detective nicknamed The Falcon. 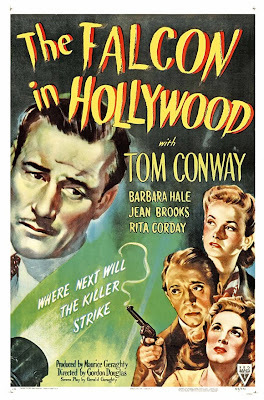 The 1941 B film was intended by RKO Radio Pictures to introduce a replacement for The Saint, after RKO decided that renewing the film rights to the latter character would be too expensive. George Sanders was cast in the title role; he had played The Saint in the prior RKO series. So I would suggest that The Falcon is possibly The Saint in everything but name, and after all, the RKO Saint films weren’t following Charteris’ stories too faithfully to begin with. After taking over from Sanders, Conway appeared in nine Falcon films, who was then followed by John Calvert for the last three films.